Groom Your Pet With Us! Grooming your pet at Jupiter Animal Hospital can be a first line of defense for spotting lumps, infections or other abnormalities that you may not notice. We have many years of experience grooming all breeds, sizes and ages of dogs. We use only high quality, professional shampoos and conditioners. We have heat-censored dryers to keep pets safe. 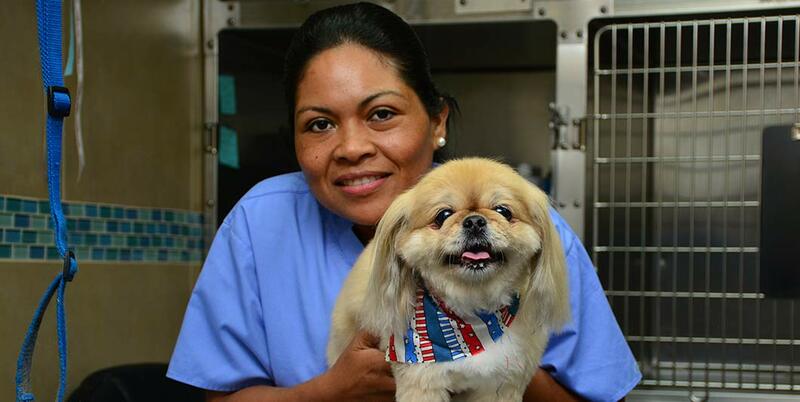 Skin, ear and any other problems can be noted by Laura and evaluated by our veterinarians while your pet is here. We will clean and check your dog’s ears, which is especially important for dogs with long or droopy ears. Our full grooming includes everything included in a bath plus a brush out, breed-standard haircut or comfort haircut, ear cleaning, gentle removal of the ear canal hair, nail trim and filing, hair trim on the face, feet and tail as needed, and lots of TLC! Our groomer will trim, style, deshed or shave your pet according to your specifications. We promise you will love your pet’s haircut, and your pet will love his or her new look too!